Shrublands serve as an important component of terrestrial ecosystems, and play an important role in structure and functions of alpine ecosystem. Accurate estimation of biomass is critical to examination of the productivity of alpine ecosystems, due to shrubification under climate change in past decades. In this study, 14 experimental plots and 42 quadrates of the shrubs Potentilla fruticosa and Caragana jubata were selected along altitudes gradients from 3220 to 3650 m a.s.l. (above sea level) on semi-sunny and semi-shady slope in Hulu watershed of Qilian Mountains, China. The foliage, woody component and total aboveground biomass per quadrate were examined using a selective destructive method, then the biomass were estimated via allometric equations based on measured parameters for two shrub species. The results showed that C. jubata accounted for 1 — 3 times more biomass (480.98 g/m2) than P. fruticosa (191.21 g/m2). The aboveground biomass of both the shrubs varied significantly with altitudinal gradient (P<0.05). Woody component accounted for the larger proportion than foliage component in the total aboveground biomass. The biomass on semi-sunny Received: 2 January 2014 Accepted: 19 May 2014 slopes (200.27 g/m2 and 509.07 g/m2) was greater than on semi-shady slopes (182.14 g/m2 and 452. 89 g/m2) at the same altitude band for P. fruticosa and C. jubata. In contrast, the foliage biomass on semi-shady slopes (30.50 g/m2) was greater than on semi-sunny slopes (27.51 g/m2) for two shrubs. Biomass deceased with increasing altitude for P. fruticosa, whereas C. jubata showed a hump-shaped pattern with altitude. Allometric equations were obtained from the easily descriptive parameters of height (H), basal diameter (D) and crown area (C) for biomass of C. jubata and P. fruticosa. Although the equations type and variables comprising of the best model varied among the species, all equations related to biomass were significant (P < 0.005), with determination coefficients (R 2 ) ranging from 0.81 to 0.96. 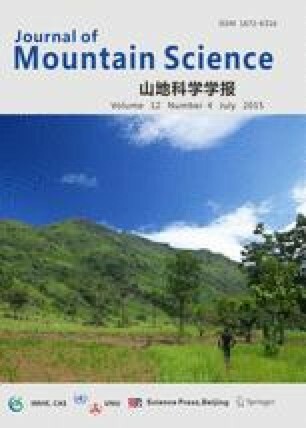 The allometric equations satisfied the requirements of the model, and can be used to estimate the regional scale biomass of P. fruticosa and C. jubata in alpine ecosystems of the Qilian Mountains.